Frank Wright very generously laid some hedges for Brighton Permaculture Trust at Stanmer and here describes this ancient skill. Travelling around the country, despite the fact that we have lost many hundreds of miles of hedgerow over the last few decades, you can still see a variety of hedges, many in poor condition for a variety of reasons; very occasionally, you may notice a distinctively tidy, staked and bound hedge that has been laid by one of a handful of practitioners of this ancient skill. 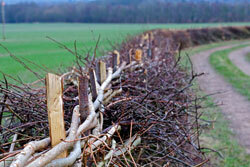 The practice of hedgelaying is hundreds of years old and, in Europe, originates from the need to create a stockproof hedge to try and separate farm animals from crops. Even a hundred years ago it was still widely practised in this country and would usually have been a winter activity. Then, as in earlier years, it was done by any farm worker not otherwise occupied, as it was not a “specialist” skill and the winter period was generally when there was time to attend to general maintenance activities. There are also the very practical considerations that the plant is “closed down” and the lack of leaves allows one to see far better the form of the hedge. Nowadays one also has to consider the well-being of nesting birds and other wildlife so the hedgelaying season runs from September/October through to March. Hedgelaying fell into disuse over time because it’s a very labour-intensive activity compared to the mechanical alternatives. Hedges have formed an integral part of the British landscape over generations, helping stabilise the land and act as a windbreak as well as marking boundaries and separating hungry animals from an attractive food source. Eradication of hedgerows, along with anything else that wasn’t a cash crop, was one of the factors in creating the “dust bowl” conditions in the southern United States in the early part of the twentieth century; a situation that we narrowly avoided repeating in parts of this country in the latter half of the century. A hedge, even if clipped and trimmed, will tend to become a line of trees; as they grow taller the stockproof nature of the former hedge diminishes until animals can walk freely between the stems of the trees. (See the “before” and “after” pictures.) In order to re-establish the stockproof nature of the barrier the hedgelayer partially severs the trunk and lays the hedge plants over at an angle, bringing the bushy part of the plant down to a level where, once again, it presents a barrier to the animals; for obvious reasons hawthorn and blackthorn were widely used as hedging plants. The partial severing of the trunk (called a pleacher) leaves sufficient of the bark and cambium layers to transport nutrients to the top of the plant – so it does not die off but continues to grow and form a barrier. This process, in the same way as coppicing, encourages shoots at the stump end and berries drop along the hedgeline to establish new growth, thus a living barrier is maintained. If left in this condition with no further embellishment the hedge would be a rather fragile structure at the mercy of strong winds and hungry animals prepared to barge through any weakness so the staking and binding (weaving long, usually hazel, binders between stakes at 18 inch intervals) binds the whole structure together to present an effective barrier. Obviously if the hedge is too patchy then it becomes impossible to create the desired barrier so “dead hedging”, pushing offcuts into the ground in line with the rest of the hedge, becomes a necessity, although this should also be accompanied by judicious planting of new hedge. The hedge will need relaying after a few years, maybe ten or twelve years or more depending upon the plants involved, with minor maintenance in the intervening years to keep it in order. In the same way as with coppicing, a hedge laid and maintained over the years enhances the longevity of individual plants and maintains the environment of the hedge for generations; there are hedgerows that are hundreds of years old. Although it would not have been any part of the original considerations for hedge maintenance a laid hedge also provides a very useful wildlife habitat for all manner of creatures, including the smaller birds and mammals, mice and voles and so on, allowing a reasonably well protected area that can provide both accommodation and a protected highway between larger habitat areas; and one of the iconic creatures of British wildlife, the brown hare, appreciates the hedgerow environment as well. Hedges also provide an effective windbreak, sufficient to take out some of the force of the wind but not likely to create the turbulence downwind that flattens crops as happens with walls and leylandii; the ideal density of hedge is such that you can detect an animal on the other side but cannot necessarily determine what it is. The basic tools of the hedgelayer are a billhook and an axe with some kind of maul or wooden mallet for driving the stakes. Nowadays the little Japanese-style saws or a pruning saw, and/or the 21 inch pointed bowsaw would also be considered normal equipment. The chainsaw has become almost universal in recent years although an expert practioner with an axe can keep pace very well, even though it is a lot more labour intensive. The skill of the hedgelayer is not merely in the wielding of the tools and the speed and economy of the physical labour, equally important is his or her ability to “read” the raw material of the hedge in order to determine how the various plants and the branches growing out in all directions can fit together, what has to be removed and what retained and how it can lock together to form the most stockproof barrier. This is the real distinction between the expert and the novice hedgelayer. If you visit the various orchards behind Stanmer House managed by Brighton Permaculture Trust you may notice that some hedges have been laid, some in the winter of 2010/11 and some in previous years. The style in which they have been laid is the South of England style, not unreasonable considering the location, although these particular examples tend to be rather thin due to the sparsity of the original material. This style is very much a living hedge, keeping brush on both sides, and dead hedging to the minimum; it’s meant to deter cattle as well as sheep in fields on either side of the hedge. This brush on both sides acts as a deterrent to the animals pushing through and as protection for the new growth at the base of the plant, which might otherwise be browsed by the farm animals or deer, and the hedge is usually finished to a height of four feet to the top of the binders. Other styles can be seen in other parts of the country; these all evolved in response to the animals that were being farmed (sheep or cattle) and the plants that were available as hedging material as well as the idiosyncratic nature of boundary marking that had developed in different areas over the years; for instance, in the South West most hedges are laid on the top of a bank and are laid very low. In the Cotswolds you may well see in the space of a few miles South of England style hedges, Midland style and also some fine examples of dry stone walling. Surrey Hedgelaying Group (once you know the basics): Please contact us if you would like to get in touch with them, and we will forward your email. If you would like to help us carry out practical tasks like hedgelaying and fruit picking, then please sign up as a volunteer, and we will email you when we need help. Alternatively, contact us if, like Frank, you have a specialist skill that you want to offer.